The results of development of the technology for manufacturing samples of insulators made of alumina ceramic with an aluminum oxide content of up to 95% are presented. The maximum tensile strength of the produced insulators has been investigated. The structures of the chip of the ceramic insulator surface have been obtained. It is shown that a change in the aluminum oxide content by 8-10% leads to an increase in the strength properties of the product by 1.5 times. The developed technology can be used to produce high-strength dielectric products, for example, antenna rod insulators, applied in the field of electrical engineering, radio engineering and other industries. The definition of the n -order ( n>=2) elastic constants of a loaded crystal and the calculation method of the second and third order elastic constants of hcp crystal under hydrostatic pressure from the energy-deformation relation are given. The energy at the various pressures and deformations of hcp iron is obtained in framework of DFT. The calculations of the second and third order elastic constants of hcp Fe at 20-340 GPa (T=0K) are performed. The Gruneisen parameters for long wave acoustic modes in hcp iron are defined. The obtained results are used for the stability analyses of the hcp phase of iron at high pressures. The effect of a constant magnetic field during the crystallization of a hypereutectic aluminum alloy on its structure in the solid state investigated. It is shown that the superposition of the magnetic field positively affects the structure of the alloy. A uniform distribution of the doped phases and eutectic in the volume of the alloy is observed. The phase of primary silicon significantly changes the size and the shape. It is established that the influence of an external magnetic field reduces the dimensions of the shrinkage defects. In general, the effect of an external magnetic field on the structure of the alloy leads to an improvement in the operational properties. The obtained measurement results showed more stable hardness values over the cross section of the sample in comparison with the alloy that was not processed. Advances in technology since the second half of the 20th century are followed as well as induced by the development of intelligent materials. These materials are able to respond to external stimuli by measurable changes in structure and intrinsic properties. Stimuli-responsive hydrogels are soft smart materials as they exhibit significant changes in physicochemical properties in response to small external stimuli. Acrylate hydrogels are widely used in applications where their smart and soft nature comes to the fore. Synthesis of those materials by conventional heating is time-consuming and unsuitable from the point of energy and sources saving. Microwave-assisted synthesis is promising method that provides polymerization under the more favourable conditions, reducing the reaction time. The focus of present work was to investigate the swelling behaviour, mechanical and thermal properties of acrylate hydrogels synthesized by microwave heating. The simple model of grain and phase boundaries diffusion into polycrystalline solid system with micro grain dimensions is proposed. There are considered different types of diffusion regimes which are realized by definite correlations between volume and grain boundary diffusion lengths and average grain sizes. The ferro-, antiferroelectric and rotational phase transitions of known binary perovskite structure oxides (ABO3) and fluorites (ABF3) have been considered. Some correlations between their phase transition temperature values, on the one hand, and the interatomic bond А-X (X–O or F) strain values, on the other hand, have been constructed. It has been established that the known perovskite structure binary oxides and fluorites with different phase transition nature, caused of a lot of their composition and structure factors, are conditioned, among another, by the interatomic bond А-X strains in their structure. In the present work, the process of water quenching of a steel cylindrical body imitating a stepped shaft is considered. The cooling function was determined experimentally, based on which the heat transfer coefficient was determined according to an existing methodology. The results obtained are used as input data for simulation using the finite element method. Results are obtained for the cooling functions at different points in two sections of the shaft. The results of the simulation are compared with the CCT curves and with the measured hardness at these points. 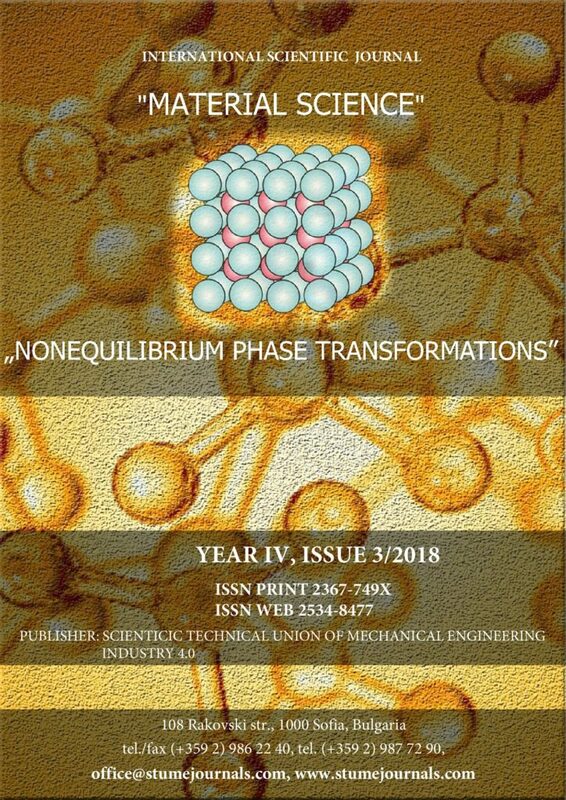 An experimental electron-beam technology for obtaining tube billets from NiCrAlY alloys used as cathodes for the deposition of heat-resistant coatings by the ion-plasma method has been developed. It is established that coatings applied to gas turbine blades of aircraft engines using cathodes of electron beam melting meet the requirements of Motor-Sich JSC TU for this type of products. mode DTCT and subsequent normalizing at 700 °C for 1 hour is more than 12 %.